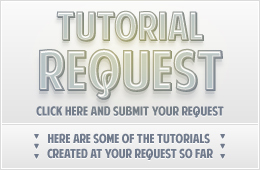 Create a 700x700px document. 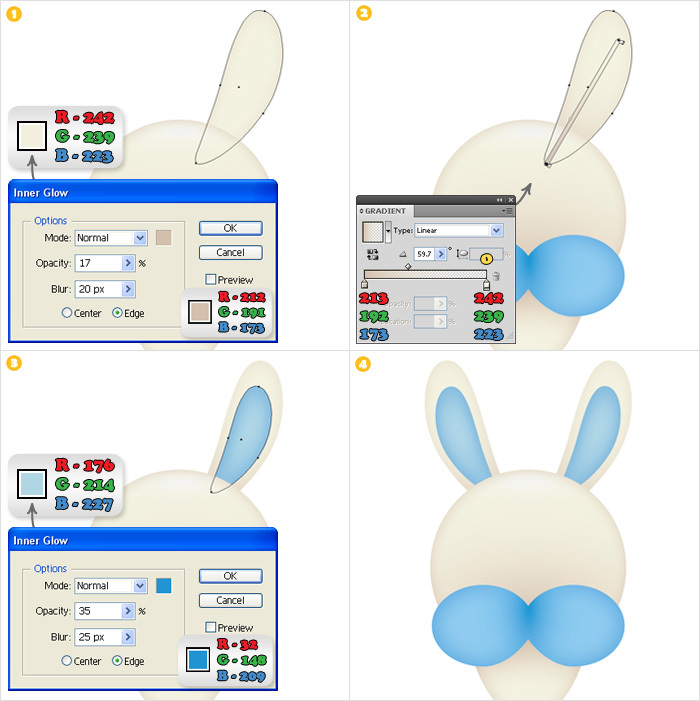 Select the Ellipse Tool(L), hold Shift and create a perfect cirle as shown in image #1(about 350×350). Fill it with R=242 G=239 B=223 and add the Inner Glow shown below image #1. Next, add two new fills (from the drop down menu of the Appearance pallete) and use the gradients shown in images #2 & #3.Name this shape “Face”. 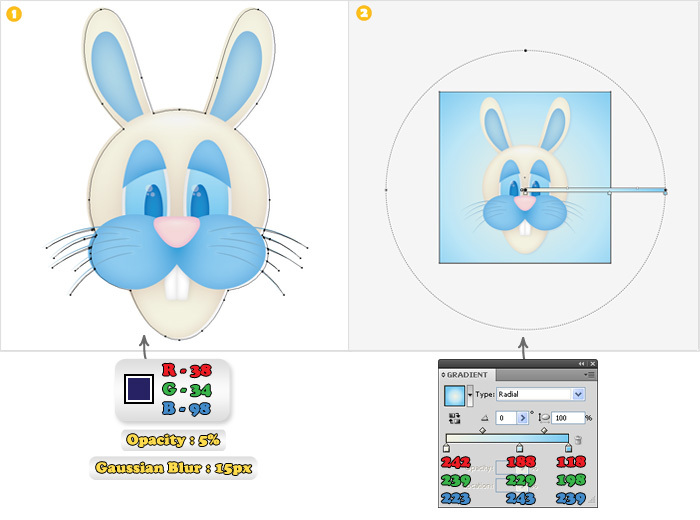 Select the Ellipse Tool and create a shape like the one shown in image #1. Duplicate it and move this copy to the right (image #2). Group these two shapes(Ctrl + G). 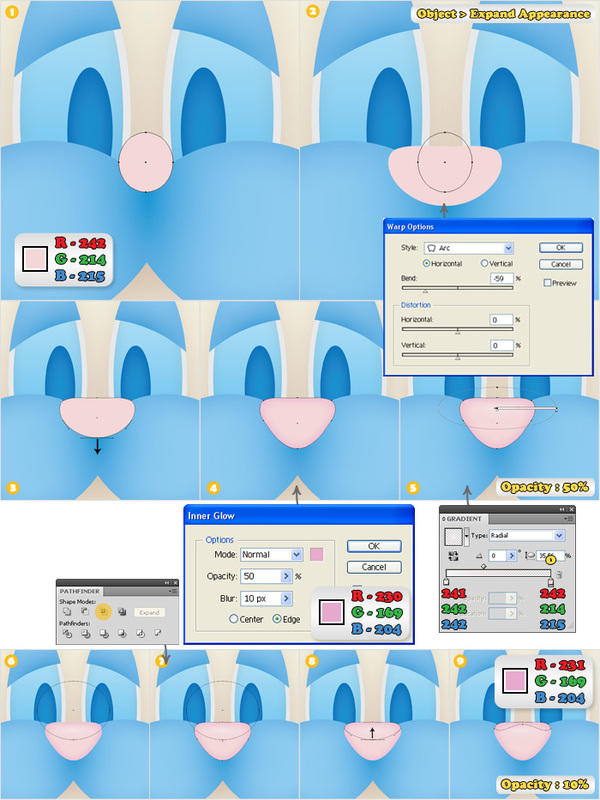 Select this group along with “Face”, pick the Selection Tool(V), click on the border of “Face”, then hit the Horizontal Align Center button from the Align pallete. Reselect the group and click on the Unite button from the Pathfinder pallete. Grab the Direct Selection Tool(A), select the Highlighted anchor point(image #5) and move it a few pixels up. Fill this shape with R=143 G=202 B=238 and add the Inner Glow shown in the image. Next, add two new fills and use the gradients shown in images #7 & #8. Select the Ellipse Tool(L) and create a squeezed ellipse like the one shown in image #1. Next, select the Rectangle Tool(M) and create a rectangle that intersect with the top half of the ellipse. Select both shapes and click on the Minus Front button from the Pathfinder pallete. Move the resulting shape between the other two shapes (in the Layer pallete), fill it with R=242 G=239 B=223 then add the Inner glow shown below image #3. Next, add two new fills and use the linear gradients shown in the last images. Let’s continue with the ears. 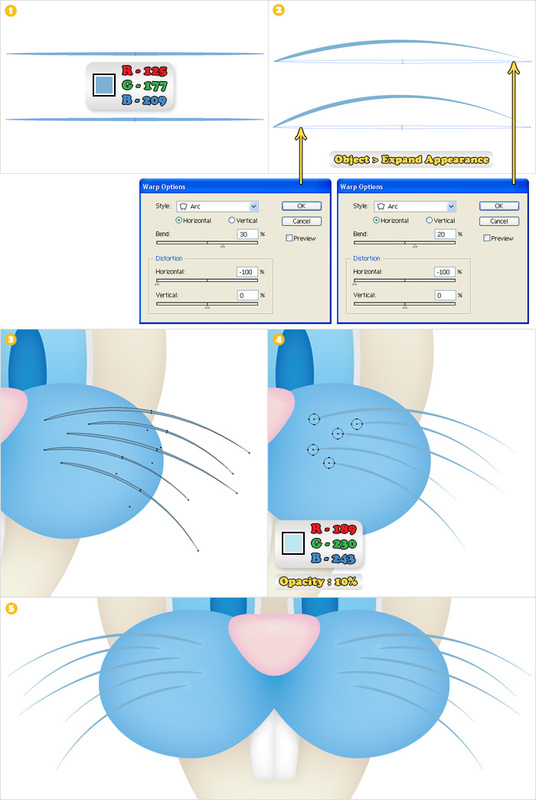 Reselect the Ellipse Tool(L), create a squeezed ellipse (image #1), add the Inflate (Warp > Inflate) effect shown below image #1 then go to Object > Expand Appearance. Select the resulting shape, rotate it 30° (Object > Transform > Rotate), add the Arc effect shown below image #4 then once again go to Object Expand Appearance. The resulting shape is the shape of the ear. Select the shape created in the previous step, move it in the bottom of the Layers pallete (Shift + Ctrl + [) and place it as shown in image #1. Fill this shape with R=242 G=239 B=223 then add the Inner Glow shown below image #1. Add a new fill for this shape and use the gradient shown in image #2. Duplicate this shape. Resize this copy as shown in image #3, change it’s fill to R=176 G=214 B=227 then add the Inner Glow shown in image #3. Now, in order to create the other ear, duplicate these two shapes. Select these two copies flip them horizontally (you can do it manually with the Reflect Tool(O) or with Object > Transform > Reflect > Vertical) then place them as shown in image #4. Now, for the eyes, select the Ellipse Toll(L). Create a shape like the one shown in image #1, and move it below the blue shape(in the Layer pallete). Fill it with the gradient shown in image #1 and add a 10pt Inner stroke (R=230 G=231 B=232). Select the fill of this shape (from the Appearance pallete) and add the Inner Glow shown below. Next, select the entire path and add the Outer Glow. Reselect the Ellipse Tool(L) and create an ellipse like the one shown in image #2. Fill it with R=28 G=117 B=188 then add the Inner Glow shown below image #2 (don’t forget to check the Center button). Duplicate the two shapes that form the eyes (the big ones). 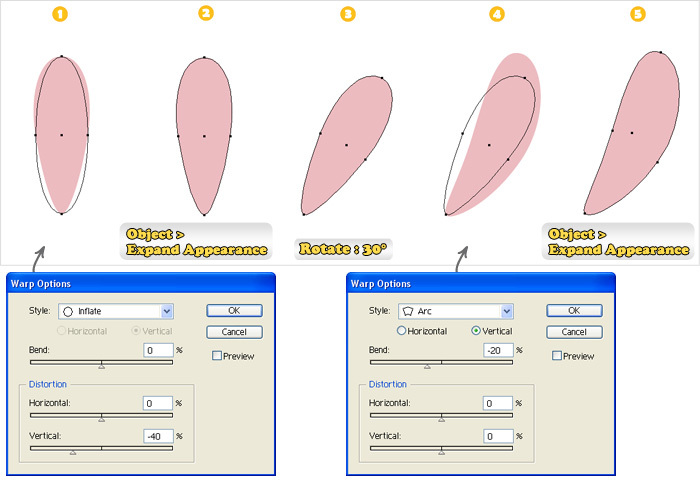 Select the Ellipse Tool(L) and create a shape like the one shown in image #2. Select it along with the two copies and click on the Divide button from the Pathfidner pallete. From this newly created group keep only the shapes shown in image #4. Fill them both with R=143 G=202 B=238 and add the Inner Glow. 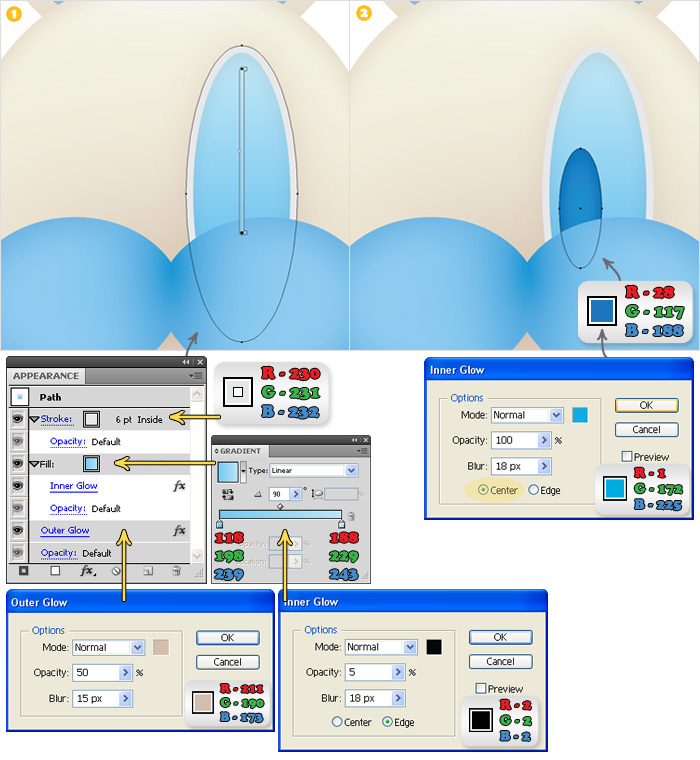 Select the right shape, add a new fill and use the gradient shown in image #5. 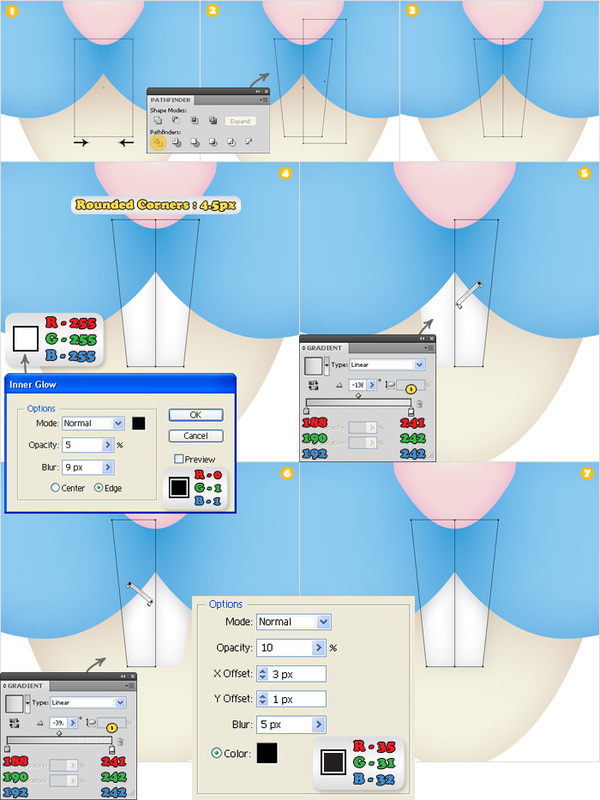 Next, select the left shape, add a new fill and use the gradient shown in image #6. Now, the nose. Pick the Ellipse Tool(L), create a shape like the one shown in image #1 and fill it with R=242 G=214 B=215. Select this new shape add the Arc effect shown in image #2 (Effect > Warp > Arc) then go to Object > Expand Appearance. Select this new shape, switch to the Direct Selection Tool(A), click on the bottom anchor point and move it a few pixels down. Add the Inner Glow shown in image #4 then add a new fill and use the gradient shown in image #5 (lower the opacity of this fill to 50%). Duplicate this shape. 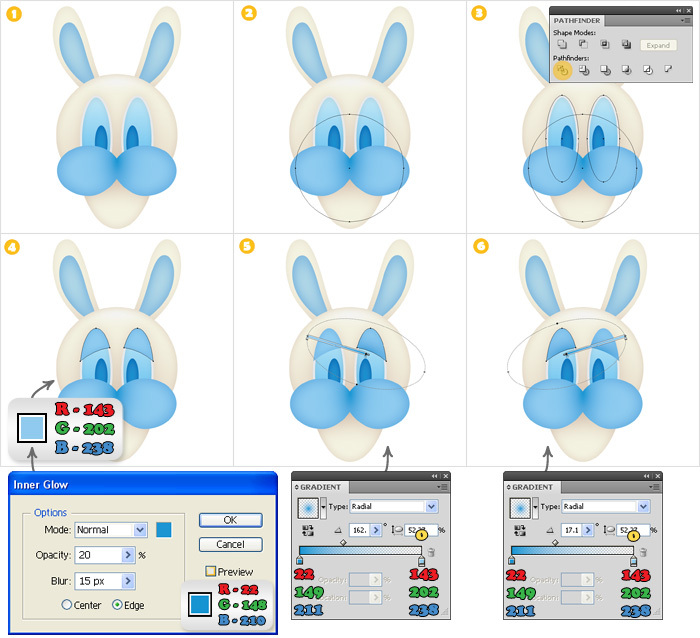 Reselect the Ellipse Tool(L) and create a shape like the one shown in image #6. Select this new shape along with the copy and click on the Intersect button from the Pathfidner pallete. Pick the Direct Selection Tool(A), select the bottom anchor point of the resulting shape and move it a few pixels up (image #8). Fill it with R=231 G=169 B=204 and lower it’s opacity to 10%. Let’s continue with the teeth. Select the Rectangle Tool(M) and create a shape like the one shown in image #1. 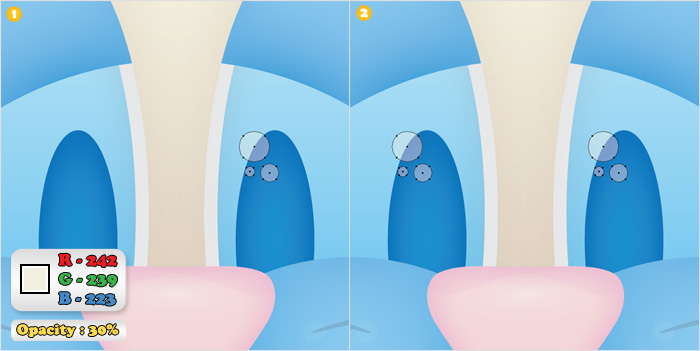 Pick the Direct Selection Tool(A), select the bottom anchor points, switch to the Scale Tool(O), hold Shift then click and drag from the outside to the inside. Reselect the Rectangle Tool(M) and create a shape that intersect with the right half. Select both shapes and click on the Divide button from the Pathfinder pallete. Keep only the two shapes shown in image #3, fill them with R=255 G=255 B=255 add a 4.5px Rounded Corners effect then the Inner Glow shown in image #4. Select the right shape, add a new fill and use the gradient shown in image #5. 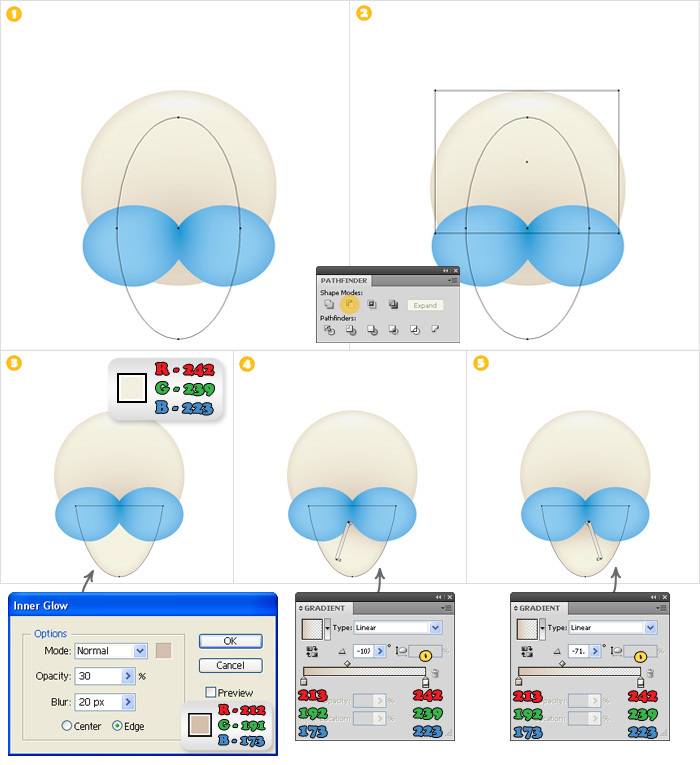 Next, select the left shape, add a new fill and use the gradient shown in image #6. Reselect these shapes and group them (Ctrl + G). Select this new group and add the Drop Shadow effect shown in image #7. Let’s add some discrete highlights for the eyes. 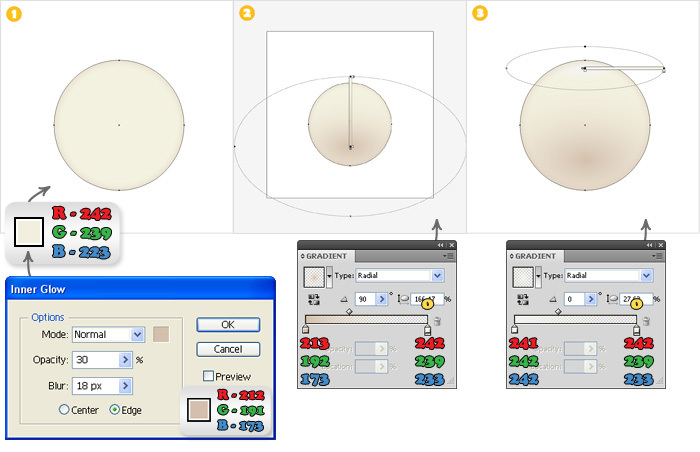 Select the Ellipse Tool and create three ellipses like in image #1. Fill them with R=242 G=239 B=223. Duplicate these circles and move them over the left eye. Lower the opacity of these six shapes to 30%. Finally let’s add a discrete shadow and a simple background. Duplicate all the shapes created so far. Select these copies and click on the Unite button from the Pathfinder pallete. Move the resulting shape in the bottom of the Layers pallete (Shift + Ctrl + [), fill it with R=38 G=34 B=98, add a 15px Gaussian Blur and lower it’s opacity to 5%. For the background, select the Rectangle Tool(M) create a 700×700 shape and fill it with the gradiend shown below image #2. 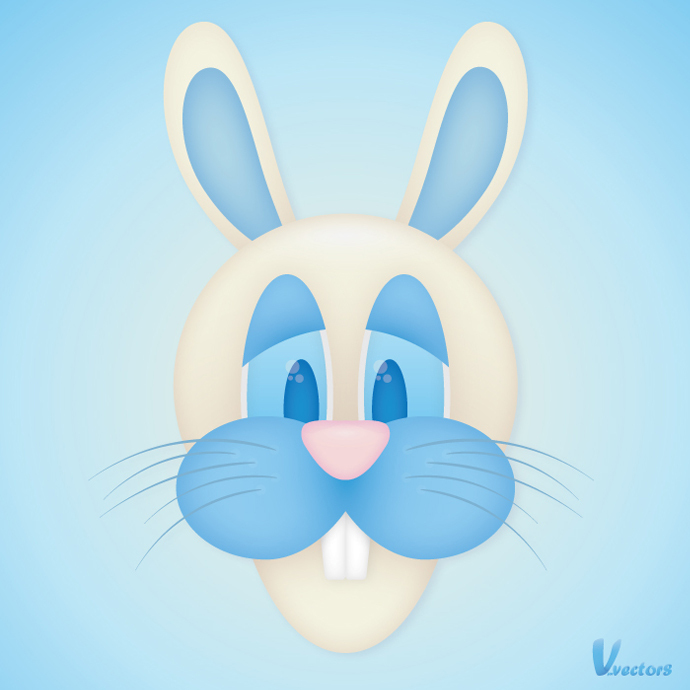 Now your goofy bunny is done. Here is how it should look like. Really! Nice tutorial… thanks alot. Great post. 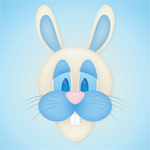 Goofy bunny is really cool. Thanks for the tutorial.